I was trying to think of what special recipe to make for Mother’s Day. 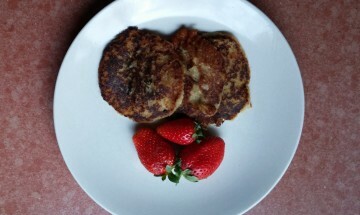 I’ve already posted recipes for muffins, pancakes and waffles. What else would be the perfect food to surprise your mom with this morning, when you serve her breakfast in bed? Crepes! 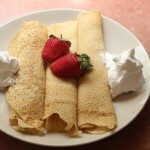 When I was a little girl, my mom use to make crepes only on special occasions. My brother and I used to steal a couple before they were actually ready to be served. 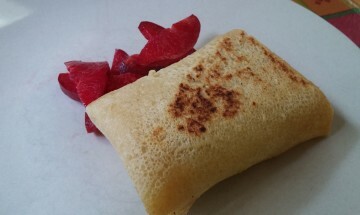 Instead of all the fancy stuff that you can put on crepes, all we did was sprinkle sugar and cinnamon on them, roll them up, and woof them down. Good times. This is a real mom's day treat! Mix together all the ingredients, making sure to get all the clumps out. Heat crepe pan and spray with oil spray. Pour in enough batter to just cover the pan, moving the pan around to cover all the edges. When crepe starts to look dry, flip it over and cook for a few seconds more. Remove from pan, and start the next one. It’s a good idea to use a good crepe pan so that the crepes come out the way that they are supposed to and so that they don’t stick. I used to use a regular frying pan, but it is so much simpler this way. 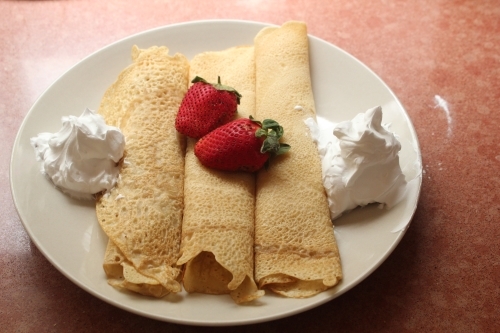 This recipe is good for both sweet and savory crepes. As a breakfast crepe, jam, chocolate spread (or carob spread for the more adventurous), or sugar and cinnamon work really nicely. I like to fill them with strawberries and put dollops of vegan whipped cream, but that’s just me. 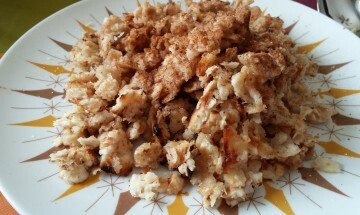 If you want to go savory, you can fry up some onions and mushrooms or practically anything else, and fill them that way. I love fried onions and mushrooms, so kids, if you’re listening, that’s the way to go. I wish all the mothers out there a Happy Mother’s Day!